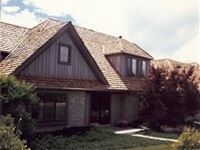 a new roof on your house that matches what is existing. However, just asking for bids without any directions guarantees that comparing the proposals will be difficult or impossible. The proposals will be like comparing apples to oranges or worse. Properly writing the Request For Proposal (RFP) puts the Property Owner in control rather than the Roofing Contractor. This is very important to keep you in charge of all aspects of the Roof Installation as it should be, after all it is your roof. This is something a Property Owner can do themselves, but it does take a lot of time and thought to properly write a RFP, asking the right questions, properly detailing the scope of the job, knowing what information to include in the RFP to get the desired results, etc. We can provide Property Owners their best chance to obtain proposals from good Qualified Roofing Contractors that meet the Property Owners wishes and desires and clarifies to the Roofing Contractor what is expected. We are very good at writing Requests for Proposals which result in proposals returned from Roofing Contractors that really can be compared to each other. Our RFP Service also contains a second optional service - the Reviewing and Analyzing of the returned RFPs. Our Request for Proposal document and reviewing and analyzing the returned RFPs service is very helpful to the Property Owners in properly deciding which Roofing Contractor is the very best fit for the replacement of their roof or roofs. The Roofing Contractor with the cheapest bid is usually not the best Roofing Contractor to use for many reasons. Our RFP contains several sections: from a documentation and summary of the existing structure and roof, an overview of the roofing work requested and job site conditions; to the qualifications required to have the proposal considered; to timelines; to Property Owner's requirements, criteria, and concerns; to what information must be contained in the Roofing Contractors proposals; etc. The RFP is written in terms that both the Property Owner and the Roofing Contractor can understand. The RFP sets the stage so that both parties understand from the start what is expected and promotes a much better line of communication. The use of our RFP is highly recommended for all, almost a must, for Property Owners who have large or complicated roofs and for Homeowner Associations of Townhomes or Condominiums. When a Property Owner or a Homeowner Association hires us to write a RFP, we always include a questionnaire that will assist in deciding which Roofing Contractor is the best fit. It asks Roofing Contractors to provide us with current information about insurance coverages, licenses, jobs, etc. This Questionnaire must be returned with the Roofing Contractor's proposal for their proposal to even be considered. How large the roofing job is. How complicated the roof lines are. How many types of roofing materials will be considered. How much time is spent in meeting with the Property Owner and phone calls/e-mails about the content of the RFP. How many people are involved in the decision process. If there are other roof related problems that must be addressed. How many questions might arise that have to be researched. How many Roofing Contractors the Property Owners have selected to receive our RFP. This optional RFP Service is performed after the RFP has been written, sent out, and the proposals are returned. The returned RFPs are sent to us for our review and analysis. We review each returned RFP and then input a lot of the information obtained from each into a spreadsheet. This RFP spreadsheet lists the key information from each returned RFP in such a way that makes it much easier and more accurate to compare the returned RFPs. This will result in a more informed and better made decision process. How many RFPs were returned. How many types of roofing materials each returned RFP contains. If there are other roof related problems that are addressed in the returned RFPs. How well the returned RFPs followed the requested information in the RFP. How much time is spent in meeting with the Property Owner and phone calls/e-mails in reviewing the returned RFPs. Using one, or better yet both of our RFP Services, will benefit you as the Property Owner in many ways: saving you money, time, and headaches, along with giving you the Peace of Mind of knowing you did all you could to minimize problems and increase the chances of having a new roof that meets your expectations and that will be there for years to come. Be sure to also visit our other related web pages especially roofkey Roofing Guidelines, Roofing Materials, and Roof Inspection Service.